U.S. Housing and Urban Development (HUD) Secretary Julián Castro today announced HUD’s latest estimate of homelessness in the U.S., noting a continued general decline and specifically among veterans and persons living on the street. HUD’s 2014 Annual Homeless Assessment Report to Congress finds that there were 578,424 persons experiencing homelessness on a single night in 2014. This represents an overall 10 percent reduction and 25 percent drop in the unsheltered population since 2010, the year the Obama Administration launched Opening Doors, the nation’s first comprehensive strategy to prevent and end homelessness. HUD’s annual ‘point-in-time’ estimates seek to measure the scope of homelessness on a single night in January. Based on data reported by state and local planning agencies, last January’s one-night estimate reveals a 33 percent drop in homelessness among veterans, including a 43 percent reduction in unsheltered homelessness among veterans, since 2010 and a 10.5 percent decline since last year. State and local communities also reported a 15 percent decline in the number of families with children experiencing homelessness since 2010, as well as a 53 percent reduction among these families who were found be to unsheltered. During one night in late January of 2014, volunteers across the nation conducted a count of their local sheltered and unsheltered homeless populations. These one-night ‘snapshot’ counts are then reported to HUD as part of state and local grant applications. While the data reported to HUD does not directly determine the level of a community’s grant funding, these estimates, as well as full-year counts, are crucial in understanding the scope of homelessness and measuring progress in reducing it. The Obama Administration’s strategic plan to end homelessness is called Opening Doors – a roadmap for joint action by the 19 federal member agencies of the U.S. Interagency Council on Homelessness along with local and state partners in the public and private sectors. The Plan puts the country on a path to end homelessness among veterans by 2015; chronic homelessness by 2016; and to ending homelessness among children, family, and youth by 2020. 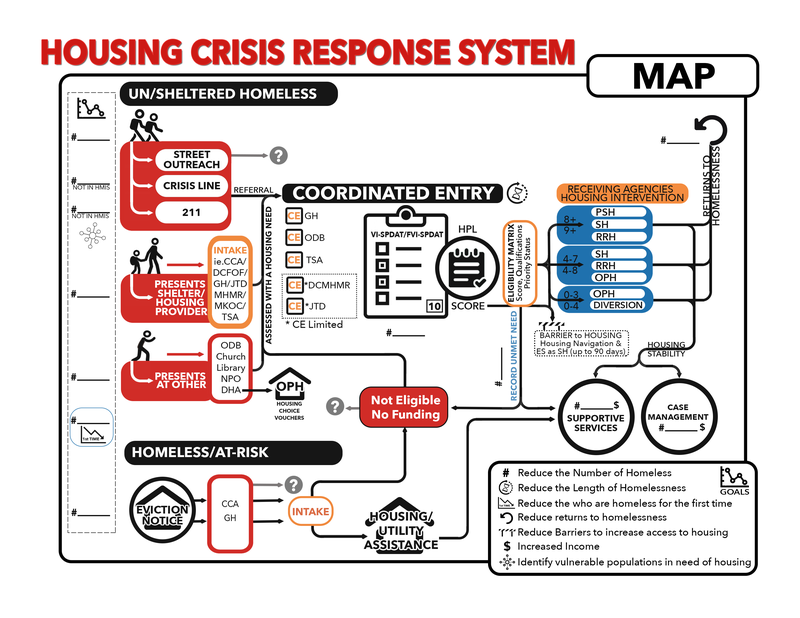 The Plan presents strategies building upon the lesson that mainstream housing, health, education, and human service programs must be fully engaged and coordinated to prevent and end homelessness. The decline in veteran homelessness is largely attributed to the close collaboration between HUD and the U.S. Department of Veterans Affairs on a joint program called HUD-VA Supportive Housing (HUD-VASH). Since 2008, more than 59,000 rental vouchers have been awarded and approximately 45,000 formerly homeless veterans are currently in homes of their own because of HUD-VASH. Long-term or chronic homelessness among individuals is declining quite substantially since 2010. This decline is partially attributable to a concerted effort to make available more permanent supportive housing opportunities for people with disabling health conditions who otherwise continually remain in shelters or on the streets. Research demonstrates that for persons experiencing chronic homelessness, providing permanent housing coupled with appropriate supportive services without treatment preconditions, is the most effective solution for ending homelessness. This ‘housing first’ approach also saves the taxpayer considerable money by interrupting a costly cycle of emergency room and hospital, detox, and even jail visits. Many communities are also making a special effort to identify youth experiencing homelessness on the night of their counts. Great strides have been made connecting young people to youth service providers, with particularly strong efforts focused on youth experiencing homelessness who are unsheltered. In addition, communities are finding creative ways to identify and engage these unsheltered youth, through efforts like youth-targeted events to more intentional use of social media outlets. 578,424 people were homeless representing an overall 10 percent reduction from January 2010. Most homeless persons (401,051 or 70 percent) were located in emergency shelters or transitional housing programs while 177,373 persons were unsheltered. Veteran homelessness fell by 33 percent (or 24,837 persons) since January 2010. On a single night in January 2013, 49,993 veterans were homeless. Chronic or long-term homelessness among individuals declined by 21 percent (or 22,937 persons) since 2010. The number of families with children experiencing homelessness declined 15 percent (or 11,833 households) since 2010. The number of unsheltered families fell 53 percent during that same time period. The number of unaccompanied homeless youth and children was relatively unchanged overall, at 45,205. There was a 3 percent decrease in those who were unsheltered. HUD Exchange. “Re: HUD Reports Homelessness in U.S. Continues to Decline.” Message to HUD Exchange Mailing List. 30 Nov. 2014. E-mail.